Thursday saw the official opening of the largest and most expensive sports project in the history of Saudi Arabia. The 60,000-seater named after king Abdullah was opened by none other than king Abdullah himself, who handed it over to the citizens of Jeddah. The stunning stadium had a proper opening with hundreds of artists, lights show and fireworks – all worth over €1 million. A short summary of the show can be found below. Another attraction was the final of the most prestigious local tournament, the Champions Cup. With local Al Ahli among the finalists, demand for tickets was huge. Though entry was free, black market prices stood at even €100 ($130) or more. But then again, how often can you experience an event like this? Odds are Jeddah isn’t getting another €380 / $530 million stadium too soon. Erection of the new sports centre was announced in a king’s decree in 2009, suggesting the city will again celebrate sport’s role in society. Initial plans envisaged a main stadium for 100,000 people and numerous other buildings spread over 900 hectares. In 2011 the plan was severely downscaled. The surface was reduced to 300 hectares, stadium capacity to 60,000, while secondary amenities limited to an athletic stadium, 2,000-capacity indoor arena, training pitches and a mosque. The entire complex was rethought to be fitted into a large circle with the main stadium at its heart. 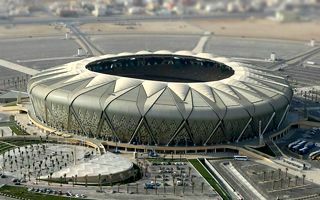 Location between Jeddah’s two major highways makes road access the most preferred one and demand is to be properly addressed by over 25,000 parking spaces spreading radially around the stadium. The stadium itself hasn’t been built along the traditional north-south axis. Instead, it was rotated by some 45 degrees west to best address local climate: provide shade and improve natural ventilation from the nearby Red Sea. Symbolically the stadium put at the heart of a large circle should be exposed like a gem. By day its surface reflects the sun and natural colours used over the façade resemble those of beach sands. By night the stadium glitters and can be seen even from large distances with light coming out through the largely perforated cladding. Geometrical decorative pattern represents local crafts, though the stadium was designed by foreign engineers, the global office Arup. The 60,000+ stands are divided into three very compact tiers. This ensures all fans have very good view of the pitch, while roof girders are ‘only’ 60 meters long and still cover all spectators. Despite the impressive size it took only 14 months to deliver the stadium, which was ready in early 2014. To achieve this amazing pace there were some 8,000 workers on three shifts.